Matt Geister of MGS Physiotherapy was recently quoted in a great article by Beverley Hadgraft of Body and Soul titled ‘Why Physios love Mondays‘. Extracts of the article are below – please click here to view the full article. Ever wondered why the physio is always booked out on Mondays? Apparently it’s all to do with the way we spend our weekends! Where would physiotherapists be without weekend injuries? A lot less busy, manipulative physiotherapist Matt Geister says. Here are some of the activities that cause injury and some tips on how to stay safe. + Tip: Shovel four or five loads with the right hand, then switch to the other side. Holding hand shears or a petrol hedge trimmer straight out in front of you and doing lots of repetitive movements under load is a recipe for tendonitis in the elbows and shoulders. + Tip: If you’re conditioned from regular upper-body exercise you’ll cope with this better. If not, take breaks every 20 minutes and stretch. Use an icepack on sore elbows when you finish. “These are now popular among older people. It’s great they’re still playing, but the incidence of knee injuries and hamstring, calf and Achilles tendon tears is very high,” Geister says. “Men in their 40s and 50s have families and stressful jobs and don’t have time to train during the week. They play at 100 per cent effort on the weekend, then crack open a beer to celebrate.” Alcohol increases blood flow so the micro tears in the muscles bleed more, leading to pain the next day. + Tip: Get some conditioning training in during the week and use ice packs for sore limbs. A long walk on a cambered or sloping beach can put force on the side of the hip, resulting in hip bursitis, hip tendonitis and ITB friction syndrome (pain in the side of the knee). “These are common injuries,” Geister says. + Tip: Find a flat beach or go bushwalking instead. The vacuum cleaner pipe is too short for many people, so they are bent over for long periods, putting strain on the lower back. Many people also tend to vacuum one-sided, which leads to pelvic alignment issues. Geister says making beds is a prime culprit for lower-back injuries. + Tip: Be aware of your posture when vacuuming, swap hands regularly and if you’re buying a new cleaner, try it out for size. When lifting mattresses to tuck sheets in, get close to the bed and use your knees rather than tilting forward. Click here to read the article by Body and Soul in full. 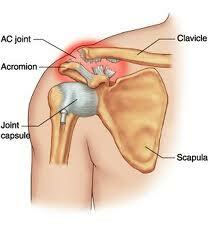 Acromion or AC Joint injury – to operate or not?